No hot water is coming down the sink when you open the tap? Want to take a bath but there is no hot water in the shower? Use this guide and learn how to deal with this problem. Most of us homeowners take hot water for granted and do not realize how important it is to have it in our daily activities. Similarly, to a vast array of other products, water heaters also tend to have problems functioning correctly, whether it is by leaking, overheating the water, heating the water too little, or by simply not heating the water at all. When a water heater is not heating water anymore, it means there is something you need to fix, so here we are going to talk about each of the things that could be making the water heater to malfunction and how to repair it. Whether you have a tankless or tank-type, a gas, or an electric water heater – you will always expect hot water to come down the shower, no matter the day or season. If it doesn't happen, you may be suffering from one of the problems water heaters tend to have. The water heating process of an electric tankless water heater consists of heating water while flowing through the heat exchanger. There is no water storage tank, as the water is heated on demand. As the electric units have a simpler design than gas, they are also easier to repair, even “no hot water” problem. “No hot water” problem in the electric water heaters doesn't require some special tools or experts to fix it. It should be simple to repair it even if you have an average knowledge and experience. No matter of the problem complexity, make sure that the power is being supplied to the water heater, check the circuit breaker, limit switch, thermostats, timer (if installed) and heating elements for proper work. Keep in mind that problems are not always related to the human error or unit malfunction, it might be caused by the lightning and high voltage, for example. When the temperature sensors or thermostats of the device don’t work correctly, the heating process stops or not starting at all. This makes water to come out the tap/sink cold. Check the sensors or thermostats if you can by opening the heater. Otherwise, contact a professional to check them out for you as they may need replacement. If there are loose wires, including those from sensors and heating elements, the device will not heat up the water correctly either. Open up the device while the power is turned off and check every wire and connection to make sure there is no wiring problem – locate, clean and reconnect properly. If you can’t find the wire issue, very likely the problem is somewhere else. Heating elements are prone to sediment buildup preventing them to heat water correctly because sediments act as the insulator. Also, most heating elements fail over time as well – they burn out. The solution for both of these problems is to replace the heating elements. The installation of these components can be tricky so it is always better to ask a professional. Check the breaker on the electric panel and make sure it is switched ON, that it didn't trip. If it is OFF, simply flip to ON position. The water heater has its own, dedicated circuit and breaker. If it happens often call an electrician to check the circuit and connections. 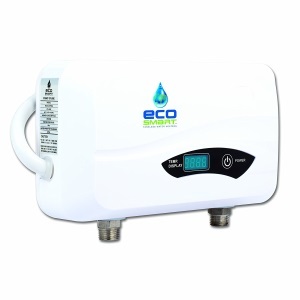 The electric water heaters with the water storage tank are also susceptible to no hot water problems. Some of the causes are the same as the one found in tankless, some are different. The thermostats (measures temperature) and the heating elements (heat up the water), can short from time to time due to electrical problems, moisture or foreign body. Both of these parts can be fixed only by replacing them. Problems in wiring, electrical accidents, or objects with electrical current may cause the electric element to ground, tripped limit switch or circuit breaker. If the limit switch has tripped, you may look for the reset button (red button) and make sure to turn it on. If the circuit breaker has tripped, switch it back on. When the device is grounded, make sure there is no current around or inside the product causing a short with wires or other parts. Also look for the worn wiring as it can lead to wire shorts or foreign objects that could lead to accidental grounding. Anyway, before doing any work on the electric elements, make sure to turn off the breaker. Calling a professional is always an option. When an electrical heater has a tank or pipe leak, it might affect the proper heater operation. If it is the tank, it might need replacing as they are almost impossible to fix. For pipes, if the hole or leak is tiny, it may be adjusted. If not, replacing would be the best idea. Sometimes pipe connections just need a little tightening. If the dip tube is broken, incoming water will go right to the hot outlet pipe without mixing first, delivering cold, instead of hot water at the fixture. The only way to fix it, however, is to replace the dip tube completely. It occurs mostly in electric water heaters with tanks. Is the gas you are using a proper type, as suggested by the manufacturer? Is the gas valve or pipe leaking? Is the pressure correct? Or is the gas just not reaching the burner? If you have a problem with gas and your water heater, very likely it will not heat up. Just make sure gas lines are able to transfer the gas, and valves are open, and that there is no leak. Look for bent and clogged supply lines as well. Try switching off gas valves, if you smell gas after 15 minutes, very likely there is a leak. Call a professional in this case. If there is no gas, you have a piping problem, or it may as well be the source of gas – so call the utility company. The thermocouple is a safety device, part of the pilot light assembly so when properly operating it allows the gas valve to open so gas can flow to the pilot and gas burner. The tip of this component should always be in contact with the flame and tightened securely to the pilot light assembly. If the thermocouple is not working correctly it has to be replaced – it cannot be fixed. The standing pilot should always be lit. Once the gas valve opens the gas flows to the main gas burner where it is lit by the standing pilot. If air or debris are found in the pilot pipe, very likely it won’t light up or stay lit for long. Make sure you test the device several times by lighting up the burner until it fires up for more than 5 minutes. If it does not, you may need to check for any impurities in the pilot and clean or replace accordingly. The gas valve is often the primary problem in most no hot water issues with these heaters. Sometimes these gas valves are clogged or defective and they won’t let gas pass to the burner. These valves can’t be fixed as other components, plus it is not recommended. The valves are pretty cheap to replace. Burners often get clogged or dirty, and they won’t merely light up correctly. Burners can be replaced very quickly if this is the case, but sometimes cleaning them up is far more straightforward. Due to the insufficient combustion air delivery, when the unit is installed in the confined area the water heater might not start. Always make sure that there is enough of fresh air supplied and that the filter and flame arrestor at the base of the unit are clean. The flame should have a blue color. If it is yellow, the room where the unit is installed needs more air supply. Make sure that the exhaust gases are properly removed and there is no blockage in the vents. Whether it is tankless, gas, or electric water heaters – fixing can be a piece of cake if you know where to look! Water heating is a complicated process that includes various parts of water heaters. Only if they operate properly the unit will provide plenty of hot water. There are many reasons for the problem “no hot water” and looking at the above troubleshooting guide, it is not hard to repair. Sometimes the problem is not the water heater, it can be power outage or gas delivery issue.